“A Tribute to Woody Guthrie and His Month of Song,” inspired by Greg Vandy’s book about Guthrie’s Columbia River tunes, features performances by Bill Frisell, John Doe, SassyBlack and Shelby Earl. It’s at Benaroya Hall on May 26. In his wonderful new book about Woody Guthrie’s Columbia River compositions, “26 Songs in 30 Days,” Seattle writer and KEXP DJ Greg Vandy points out that these songs slipped into the American imagination not from radio or recordings, but by being sung in school classrooms and at campfire singalongs, labor rallies and hootenannies. Vandy will be speaking and signing books Thursday (May 26) as part of “A Tribute to Woody Guthrie and His Month of Song,” inspired by his book. It features an eclectic roundup of ace performers, including guitarists Bill Frisell and Luke Bergman; singer-bassist John Doe, of the seminal L.A. punk band X; psychedelic soul singer Sassy­Black; Dave Alvin, of the L.A. roots-rock band The Blasters; five singer-songwriters — Shelby Earl, Gerald Collier and Sera Cahoone, from Seattle; Ian Moore, from Austin, Texas; and Tim Easton, from Nashville, Tenn. — and, curiously, former Seattle mayor Mike McGinn. 7:30 p.m. Thursday, May 26, at Illsley Ball Nordstrom Recital Hall, Benaroya Hall, 200 University St., Seattle; $35-$45 (206-215-4747 or benaroyahall.org). Frisell, for his part, plans to perform an instrumental version of “Pastures of Plenty,” as he did at “Woody Guthrie: A Better World,” two years ago at Jazz at Lincoln Center, in New York. 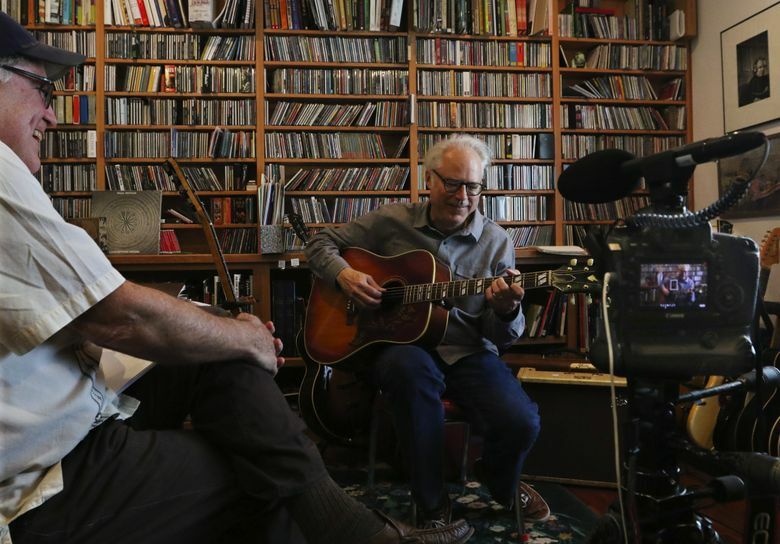 Local musician Bill Frisell talks about performing Woody Guthrie songs. Indeed, part of the message Guthrie tried to get across for the BPA was that through irrigation the new dam would bring prosperity to Eastern Washington by transforming desert into rich pasture for Dust Bowl refugees. Things didn’t turn out quite that way — the Okies never came — but other farmers did, and the idealism of the song endured. And that’s what Woody Guthrie was all about, says Frisell. No doubt that spirit will surface at Benaroya Thursday.